2Professor, Department of dermatology, SMS Medical College & Hospital, Jaipur. 3Assistant Professor, Department of dermatology, SMS Medical College & Hospital, Jaipur. Maheshwari A, Agarwal US, Meena RS, Purohit S, Thalore SK. Clinicopathological correlation in erythroderma. JDA Indian Journal of Clinical Dermatology. 2018;1:75-79. Background: Erythroderma, or generalized exfoliative dermatitis, is a disease characterized by erythema and scaling involving more than 90% of the body's surface. Diagnosing erythroderma is easy but finding its cause is difficult. There is a paucity of Indian studies over the etiology, clinical profile and its histopathological correlation. Aims and objectives: To assess the demographic profile, clinical features and histopathological correlation in erythroderma patients. Material and Methods: We registered all patients of erythroderma consecutively from January 2013 to December 2014. After a thorough history and clinical examination, a provisional clinical diagnosis was made. We performed biopsy from two representative sites of patient and it was sent for histopathological examination. The slides were examined by three independent observers without any relevant clinical information. The clinical diagnosis was matched with the blinded microscopical diagnosis. Results: A total of 66 patients were enrolled in this study. The mean age of the study group was 53.7±16.56 years (Range: 14 to 86 years) with male outnumbering female in a ratio of 3.4:1. Most common cause of erythroderma noted in the study was eczema of various types (53.03%), followed by psoriasis (30.30%), drug induced (12.12%), lymphoma (1.515%), mycosis fungoides (1.515%) and idiopathic (1.515%). Clinico-pathological correlation occured in about 67% (range: 63.6% to 68.2%) of patients (k value 0.495 to 0.572). Conclusion: Most of the clinical features of erythroderma are overlapping. Specific and diagnostic features of diseases are seen only in a few patients. Clinico-pathological correlation should be done for better diagnosis of patient. Repeated evaluations, close follow-up and multiple skin biopsies are recommended for a better clinical diagnosis and patient care. The study was performed to find out the causes of erythroderma in north-west part of India, to find out the epidemiological, clinical profile of these patients and histopathological correlation. The study was conducted from January 2013 to December 2014. All cases of erythroderma attending skin outpatient department were included in the study. A thorough history followed by a meticulous general, physical and dermatological examination was to form a clinical diagnosis. Laboratory investigations including complete hemogram, blood glucose, blood urea, serum creatinine, liver function test, serum electrolytes and chest radiograph were done in all cases. Other relevant investigations including abdominal ultrasound, peripheral blood smear, fine needle aspiration cytology (FNAC) of lymph nodes and CT scan were done wherever needed. A four millimeter skin punch biopsy was performed in all patients from two representative sites. The slides were independently analysed by three different observers without relevant clinical information. Histopathological diagnosis was correlated with clinical diagnosis to make final diagnosis. A total of 66 patients were enrolled in this study. The mean age of the study group was 53.7±16.56 in years (range : 14 to 86 Years). Males outnumbered females in a ratio of 3.4:1. The total duration of disease ranged from 10 days to 20 years with an average duration of 3.9 years. The exacerbation of disease was from 7 days to 1 year with a mean of 1.9 months. Majority of male patients were involved in outdoor activities and were farmers (39.4%) and laborers (16.67%). Majority of female patients were housewives (80%). Most common aggravating factor was seasonal variation. Seasonal exacerbation was present in about 51.51% of patients. Winter exacerbation was present in 40% of psoriasis patients and 2.8% of eczema patients. Summer exacerbation was present in 54.2% of eczema patients and 25% of psoriasis patients. History of atopy was present in 19 patients. Drugs were responsible in 8 patients. History of preexisting skin disease was present in 30 patients (62.1 %). Other co-morbidities like hypertension were present in 26 patients (39.3%), diabetes in 4 patients (6.06%), and tuberculosis in 4 patients (6.06%). The site of onset of erythroderma was scalp and face in 28 patients (42.4%), extremities in 27 patients (40.9%), and trunk & abdomen in 11 patients (16.67%). Most common clinical features were itching (98.48%), fever ( 3 1 . 8 % ) , s h i v e r i n g ( 4 0 . 9 % ) , a r t h r a l g i a ( 1 3 . 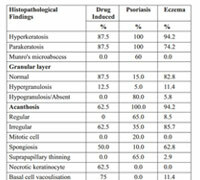 6 3 % ) , lymphadenopathy (62.1%), edema (51.5%), palmoplantar keratoderma (22.7%) and nail changes (57.8%) [Table1]. The clinical finding in psoriasis, dermatitis and drug induced ertythroderma have been described in detail in Table 2. Most common nail change was beau’s line followed by shiny nails, yellowish discoloration of nails, subungual hyperkeratosis, pitting, and onycholysis. In 3 patients, twenty nail dystrophy was present. Investigations revealed anemia in 33.3%, increased ESR in 37.9%, abnormal TLC in 18.1%, abnormal LFT in 15.2%, hypoalbuminaemia in 34.8% and abnormal RFT in 9.09% of cases. In our study, most common cause of erythroderma was air borne contact dermatitis compared to Hulmani et al where most common etiology was psoriasis.8 The different etiologies of erythroderma found in various studies has been summarized in Table 5. Clinico-pathological correlation occured in about 67% (range: 63.6% to 68.2%) of patients. In a similar study by Zip et al, 4 each set of pathological diagnoses was compared with the final discharge diagnoses, a positive correlation of 86% was observed in the nonblinded (original) diagnostic group as opposed to 66% in the blinded group. The results of blinded group were in accordance to our study which is also a blinded study. In another study by Vasconcellos et al,1 one or more skin biopsies along with clinical findings were diagnostic or suggestive of the underlying disease in 63.6% of the cases. Khaled et al 14 reported positive clinico–histological correlation in 77%, Jun Li et al 6 in 55.56% and Rym et al 11 in 74% of patients. The histopathology of eythroderma differs depending on the underlying diagnosis. In our study, in psoriasis patients the findings observed were munromicroabscess (60%), dilated blood vessel (80%), suprapapillary thinning (65%) and mitotic cells (20%). In similar study by Zip et al,4 biopsies of psoriatic erythroderma patients revealed suprapapillary thinning, dilated blood vessel and munromicroabscess in 69%, 81% and 69% of patients respectively. fissuring, presence of beau’s lines, nail discoloration are useful for diagnosing eczema in erythroderma patients, but in our study we found that these changes were also present in some patients of psoriasis. Thus these changes might help in diagnosis of eczema but they are not diagnostic and a biopsy should be done in all patients to confirm diagnosis even when sure clinically. Comparison of our etiologic diagnosis with the previous studies is compiled in table 4. In our case series, most common final diagnosis was eczema. It is quite different from other studies where it constituted a minority group. Although clinical diagnosis is possible in most cases, histopathology is required to corroborate with clinical diagnosis and to avoid any misdiagnosis as clinical features might overlap, for example psoriasis Versus eczema. Microscopical clues that might help in diagnosis are munromicroabscess, dilated blood vessel and suprapapillary thinning for psoriasis and necrotic keratinocyte, basal cell vacuolization and eosinophils for drug induced erythroderma patients. Erythroderma still remains a challenge and requires skills of the dermatologist. 1. Vasconcellos C, Domingues PP, Aoki V, Miyake RK, Sauaia N, Martins JE. Erythroderma: Analysis of 247 cases. Rev Saude Publica. 1995;29:177–82. 2. Botella-Estrada R, Sanmartin O, Oliver V, Febrer I, Aliaga A. Erythroderma: A clinicopathological study of 56 cases. Ama Arch Derm Syphilol. 1994;130:1503–07. 3. Hasan T, Jansen CT. Erythroderma: a follow-up of fifty cases. J Am Acad Dermatol. 1983;8:836–40. 4. Walsh NM, Prokopetz R, Tron VA, Sawyer DM, Watters AK, Murray S, Zip C. Histopathology in erythroderma: review of a series of cases by multiple observers. J Cutan Pathol. 1994;21:419–23. 5. Sehgal VN, Srivastava G. Exfoliative dermatitis: A prospective study of 80 patients. Dermatologica. 1986;173:278–84. 6. Li J, Zheng HY. Erythroderma: A Clinical and Prognostic Study. Dermatology. 2012;225(2):154-62. 7. Sehgal VN, Srivastava G, Sardana K. Erythroderma/exfoliative dermatitis: a synopsis. Int J Dermatol 2004;43: 39–47. 8. Hulmani M, Nandakishore B, Bhat MR, Sukumar D, Martis J, Kamath G, et al. Indian Dermatol Online J. 2014;5(1):25-9. 9. Bandyaopadhyay D, Chowdhury S, Roy A. Seventy five cases of exfoliative dermatitis. Indian J Dermatol. 1999;44:55–7. 10. Pal S, Haroon TS. Erythroderma: A clinico-etiologic study of 90 cases. Int J Dermatol. 1998;37:104–7. 11. Rym BM, Mourad M, Bechir Z, Dalenda E, Faika C, Iadh AM, et al. Erythroderma in adults: A report of 80 cases. Int J Dermatol. 2005;44:731–5. 12. Sudho R, Hussain SB, Bellraj E, Frederick M, Mahalaxmi V, Sobhana S, et al. Clinicopathological study of exfoliative dermatitis. Indian J Dermatol Venereol Leprol. 2003;69:30–1. 13. Chaudhary A, Gupte PD. Erythroderma: A study of incidence and aetiopathogenesis. Indian J Dermatol Venereol Leprol. 1997;63:38–9. 14. Khaled A, Sellami A, Fazaa B, Kharfi M, Zeglaoui F, Kamoun MR. Acquired erythroderma in adults: a clinical and prognostic study. J Eur Acad Dermatol Venereol. 2010;24(7):781-8.